The health effects of mold where you work or live? - Environmental Studies, Asbestos Investigations, Industrial Compliance & Soil/Groundwater Remediation. The health effects of mold where you work or live? Mold spores are everywhere. Every time we enter a building, we bring in outside air along with mold spores. The spores are on our clothes, shoes and in the air. Normally, these mold spores, do not affect us. However, when the conditions are right and mold grows, it can be another story. What are these conditions? 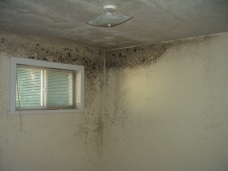 Water and moisture – If water is present or humidity high (greater than 60 percent) mold often grows. Porous materials – If dry wall, carpet, wood and fabric become moist or wet, they provide the perfect medium for mold to grow. What are the health effects of mold? It can range from headaches, fatigue, coughs, respiratory problems, similar to colds and the flu, to bloody noses and even skin problems. In some people, this exposure to mold spores suppresses their immune system and then other health problems result. Mold spores produce toxins in order to survive, these are called mycotoxins. Mycotoxins can affect human health and cause allergic reactions, sometimes very severe reactions. The mycotoxins exist in the shell of the mold spore. This means that even dead mold spores can have an adverse effect. If you are experiencing some of these health effects over a period of time you may want to consider whether mold is present in your environment. A mold inspection of the environment is recommended along with air testing. If mold is discovered, it is important for it to be remediated and Turn-Key Environmental can help develop a plan that alleviates the bad health effects of mold.